There is so much chatter about trying to gain Israel the sympathy of the other countries, and so much effort and attention is focused on this. This is ridiculous. Israel was upset that foreign media labeled the massacre in Itamar as the act of an intruder, rather than a cold blooded calculated terrorist attack. It is hard for a Jew to understand that most of the world doesn't value life the way we do. Television and the media are full of footage of graphic brutal murders, real and imaginary, shows like Criminal Minds and horror movies have made the average person familiar and accustomed to the idea and occurrence of ruthless hollow murder. So when the world is showed even the most grizzly pictures of what took place in Itamar, they are kind of bored, they think Israel is just experiencing what they have known their whole lives. The world doesn't understand that in most haredi neighborhoods there is no police presence (except when the police are causing the problems and harassment), there is no need or desire for them. There are occasional thefts and cases of abuse and the like R"L, but they are kind of rare, and there is almost never any serious cases of violence C"V.
B"H for Nanach, the true way of expressing our values, the values of Rabbainu. 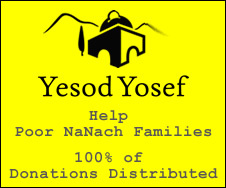 Nanach is a demonstration of our inner values, without trying to show or prove anything to anyone, just to let the inner goodness of H"Y and His Tzadik come to the surface and shine upon the world. The more we merit to spread the holy message of Na Nach Nachma Nachman MeUman the more the world gains appreciation for what is good and what is holy, and the more they shun and demean immorality and evil. There is no other effective method to restore moral values and perspective, nor could there be a better, more efficient way!